I was helping a friend in China research Danube river cruise options for his upcoming trip to Europe. I have wanted to do a similar cruise so I too was curious of the options so I spent some time researching the options. As you would expect from a savvy search marketer, I did a search in trusty Google. 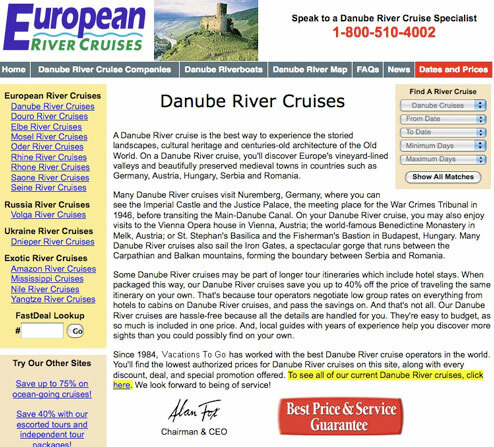 The #1 organic listing for “Danube river cruise” was the site European River Cruises (shown below) – they are also the top paid search listing. I clicked the link and landed on following page. Slightly over optimized (multiple phrases in the title tag and choppy body copy) but it told me a bit about cruising on the Danube. I clicked the highlighted text to learn more about the options and prices and was stopped cold by a form asking me to register to get the information. This is a little too old school for me. I did not see the need to register and hit the back button twice to return to my Google results page. I looked at the next few sites in the listing and since I was curious, visited the rest of the top 10 sites. ALL of the remaining 9 sites within the top 10 offered me detailed information about the various cruise options, dates, schedules and pricing without having to register. I picked two or three to send to my friend in China who ultimately booked with one of them. I will most likely book with one of those finalists as well. That was a 2 for 1 opportunity that this site totally missed. 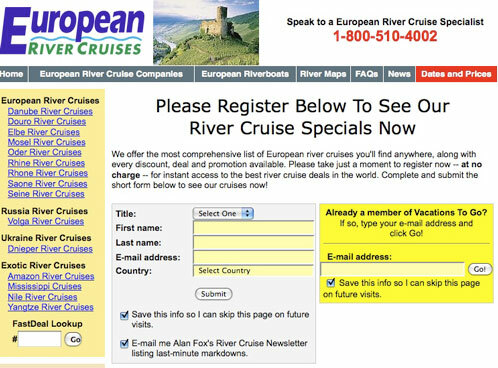 What I would suggest to the team at European River Cruises is that they look at their bounce rates, especially with paid search. If nearly everyone is completing the form then that is great and that would mean I am just the odd ball. My guess is they are not completing the form. That means all of their hard work to achieve that coveted #1 position has been squandered by the perceived need to capture email addresses. Now, I agree with the attempt to capture email address and for that maybe offer tips or something special. In their paid search they are offering 50% off bookings. Have some call to action like – “ask us how you can save 50%” or something to have them engage. The moral of the story is we often have to give a little to receive a lot. Who knows if these guys had killer cruises to choose from – I did not take the time to look.